Size of this preview: 440 × 599 pixels. Other resolutions: 441 × 600 pixels | 1,916 × 2,608 pixels. Deutsch: Offizielles Präsidentschaftsporträt von Barack Obama. فارسی: پرتره رسمی باراک اوباما رئیس جمهور ایالات متحده آمریکا ، لحظاتی پیش از شروع به کار. 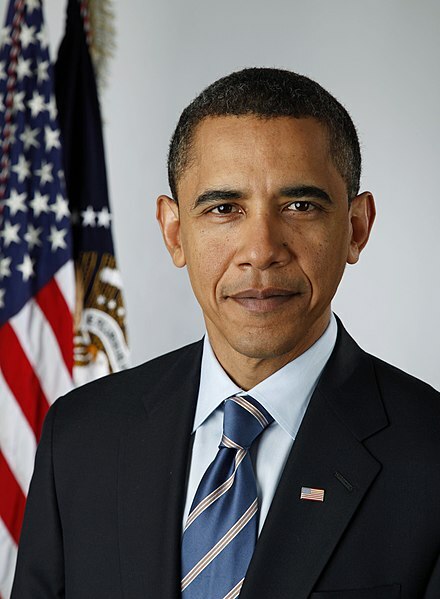 Français : Portrait présidentiel officiel de Barack Obama. Gaeilge: Portráid oifigiúil Barack Obama, uachtarán na Stáit Aontaithe Mheirceá. Italiano: Fotografia ufficiale del Presidente degli Stati Uniti d'America Barack Obama. 한국어: 대통령 취임 이전에 촬영한 제44대 미국 대통령 버락 오바마의 공식사진. Nederlands: Presidentieel staatsieportret van Barack Obama. Português: Retrato presidencial oficial de Barack Obama, tirado pouco antes de sua posse. Српски / srpski: Званични портрет председника Сједињених Америчких Држава Барака Обаме. Türkçe: Barack Obama. Obama'nın resmî başkanlık portresi olan bu fotoğraf görevi aldıktan kısa bir süre sonra çekilmiştir. The website states ( http://change.gov/about/copyright_policy ) that its content is "licensed under a Creative Commons Attribution 3.0 License. Content includes all materials posted by the Obama-Biden Transition project." This license applies to all the materials posted by the Obama-Biden Transition project per the copyright notice on the Change.gov website unless otherwise stated.